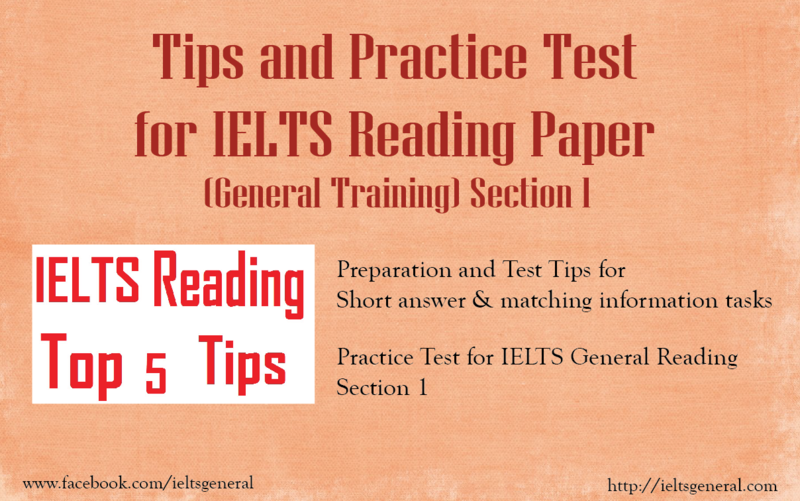 On the next page there is a practice test for IELTS Reading Section 1. Here are some tips to help you with this section. Tick (✓) the tips that you need to practise most. • Time is enormously important in IELTS Reading. You have less than 90 seconds for each question, so you do NOT have the time to read all the texts carefully. Only read carefully those parts of the text that contain the answers. • Read the task instructions very carefully. Do exactly what the instructions tell you to do. You will lose marks if you don’t follow the instructions. • Divide your time equally between the sections. Candidates sometimes spend too much time on a question or a section, and the result is that they don’t have enough time for the last questions. Don’t do this! • See Unit 7B, p. 22 for tips on doing short answer questions and matching information tasks. 2 Skim the questions (See Unit 3 for more information on ’skimming”). 5 Scan the text for the answers that require specific information. carefully to understand the details (readingfor detail). • When the questions require specific information e.g. names, numbers, dotes, places, you need to scan the text to find the answers Remember, when you scan you just look for the specific information. Scanning is quick and direct. Don’t waste time reading in the wrong way! to find specific information in them quickly. Read the advertisements below and answer Questions 1-4.
a driver and non-smoker. I have lived in Ikrlin for more than 7 years; my English and Spanish are very good. I am looking for a live-in nanny job in Madrid from November. If you need a loving, caring, responsible person to look after your children and teach them English, please contact me by email or by phone. Indian web publisher seeks work: Website design, desktop publishing, book layout, graphic design. Part time or contract. with vast experience of Microsoft packages, Sage and a range of other bespoke systems. Science and Maths lessons given, experienced tutor, specialising in helping secondary school students with their state exams. Look at the six job advertisements A-F.
Write the correct letter, A-F, in boxes 1-4 on your answer sheet. 1 Which person wants a teaching job? 2 Which two people mention their foreign language skills? 3 Who would be willing to do part-time work? 4 Which two people describe their personal qualities? Write the correct telephone numbers in boxes 5-10 on your answer sheet. 5 you don’t know where to buy something you need? 6 you suddenly feel very ill? 7 you are having problems getting used to being in another country?8 you don’t understand the procedure for finding a place to stay? 9 you want to do some exercise? 10 you don’t know if your salary is right? Read the text below and answer Questions 11-14. Prepare answers to questions which you think the interviewer may ask you. Think of examples of your achievements in previous jobs or while at school, and how you have managed any difficult situations. Think about your personal strengths and weaknesses, or how you would describe your own personality. Make sure that you know the correct English expressions to describe what you have done in the past. 11 What personal information are employers particularly interested in? 12 What should you prepare before the interview? 13 Whose needs must you try to understand in the interview? 14 What other personal information will the interviewer want to know about? can u email the answers please? Please can you send me the answers to the reading test 1 and 2 above so as to assess my progress. I can’t find the answers for ielts general training practice test papers. Could you please advice? please tell the answers of the above reading test….